I bought a Juniper SRX100 as my Buffalo access point/router did not keep up with my upgraded Internet connection speed. I hadn’t used Junos practically at all before that so that world was new for me. I had some specific requirements for my new router: Size (small enough to fit my “main distribution facility”), not very power-hungry, but feature-rich. From the features full IPv6 support was one of the most important ones. Cisco ASA5505 was one candidate but it has a ridiculously big power brick. This also seemed like a good chance to check Junos, so with SRX100 I went. I’ve had my Hurricane Electric Tunnelbroker account for several months so now I finally had a chance to implement a tunnel. There are lots of hints and instructions about configuring the HE tunnel with SRX100 but somehow they all (all that I found) missed some details. 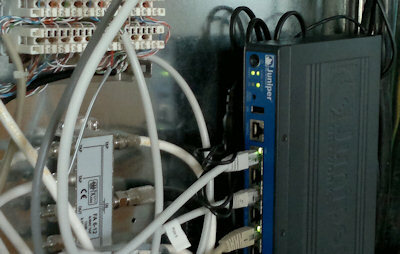 Here is my configuration for the IPv6 tunnel. Note that I started from out-of-the-box configuration with my SRX100. There are other configuration statements as well, for my IPv4 policies and services and other “basic” stuff. Here are only the commands needed for IPv6 tunnel and RA. Now, the IPv6 flow mode does not apparently work correctly on this version of Junos, so some recommend using packet mode instead. I don’t like the idea of using plain packet filters (or whatever) instead of the stateful firewall (at least that is now I understand using packet mode instead of flow mode: you lose the stateful firewall policies). # Creating a packet filter named "outside"
After that the IPv6 flow mode started working. I thought that the “filter input” statement there meant that the filter is only applied to packets coming in the interface but apparently there is also something else: the filter fix did not work without the “destination-address 216.66.80.90” rule. Don’t ask me why (but if you know please comment below!). As shown, the flow was also recorded correctly in the process. Just done on my box, great; even simpler, just one term on the firewall filter, with protocol 41 and packet-based does the job. I use a Dell Juniper SRX 210B with version 10.3R2.11 but I can’t use the command set interfaces vlan unit 0 family inet6 … Is this a OS problem ? Hi Kevin! I don’t have personal experiences of Junos versions prior to 10.4 so I don’t know exactly, but I would guess “yes”. I have a post about upgrading Junos here if it helps, just search for Junos.